More Field Trip Time Travel! I would dearly love to go to the Ellis Island Immigration Museum. I have a great admiration for basically all immigrants because I don’t think I could ever be one. I can’t imagine leaving my country behind–I’d be too homesick. I find stories of immigration inspiring, so of course I loved it that this museum is the setting where begins The Orphan of Ellis Island, Elvira Woodruff (1997, 174 pages). This is the second book I’ve reviewed by Ms. Woodruff, and I thought it was light years better than the Disappearing Bike Shop, reviewed in my very first post (here). 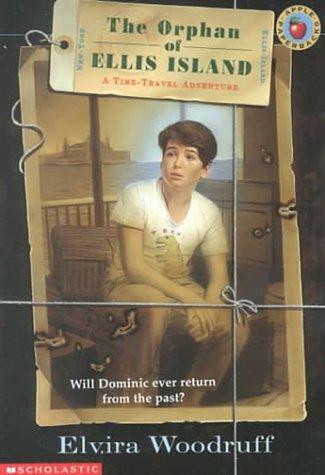 Dominic Cantori is an orphan. He has been bounced from foster family to foster family his whole life. After just a few days with his latest family and latest school, he goes on a field trip with his class to the Ellis Island museum. The tour guide asks the kids about their heritage, and Dominic feels terrible because he doesn’t know anything about his family history. How he wishes he fit into a family, and knew his family’s story. Dominic makes something up, then fears he might have to explain further and be caught out in his lie. He sneaks off and hides in a closet, planning to stay there a few minutes. But he sleeps longer than planned, and when he wakes up, it is night. The museum is closed and there is no one else there. One of the interactive exhibits becomes more interactive than expected and Dominic finds himself transported to 1908 Italy. There he meets three orphaned brothers about his age. They quickly become close friends, and Dominic experiences something of the feeling of family he’s been longing for his whole life. But even his friends can’t stay in Italy. This book was full of emotion from the start. Dominic was a well-developed character. Interesting to me, there was profound tension in the plot, but none of it stemmed form the main character wondering if he would be stuck back in time as is the case in almost all other time travel stories. This is a heartwarming book that could spark interesting discussions about family history. This entry was posted in Book reviews and tagged Book reviews, Ellis Island Immigration Museum, Elvira Woodruff, kids' time travel stories, middle grade fiction, The Orphan of Ellis Island, time travel books, time travel books for children. Bookmark the permalink. 8 Responses to More Field Trip Time Travel! A friend of mine, and several generations of her family, visited Ellis Island together and stood in the shoes of their Dutch heritage. It was one of the neatest vacation ideas I’d ever heard about. This book sounds like one I would love. I want to take that vacation! How wonderful. I have read this book with my 5th grade students more than once. They always love it and the fabulous characters have them laughing and learning. Awesome review! It’s always fascinating to me out of all the books available which ones get chosen by teachers to read with their classes. Thanks for sharing. Laura, Yeah, the author makes 1908 Italy sound pretty great.